I was recently reading an old science fiction novel in which everyone in the galaxy spoke a single “universal” language. It’s a neat concept, but when I thought of present-day Earth, I had to laugh: not only do we not speak the same “universal” language, there isn’t even a “universal” alphabet. Quite a few languages utilize their own specific set of alphabetical characters; for example, there’s Chinese, Japanese, Korean, Arabic, Greek, and Cyrillic. Some languages utilize characters which are primarily identical to those of the English alphabet with a few exceptions (French is an example) or which make extensive use of accenting and diacritical marks (such as Spanish). This leads to occasional translation problems between languages; sometimes characters from two separate languages don’t exactly correspond to one another. A phonetic solution is sometimes attempted, but even this “fix” sometimes falls short of the mark; the capital of China has enjoyed two different Western spellings and pronunciations in my lifetime, and at least four of them in the last century or so. What does this have to do with chess? The game of chess is truly international and is played practically everywhere; there’s even an official chess Olympiad in which players from all over the globe compete in a team format. The global nature of the game means that different players come from nations which use different alphabets, and this can lead to problems in databases of chess games. Two of the most commonly cited examples both occur as the result of translations from the Cyrillic alphabet to the Western (English) alphabet: Aron Nimzovich and Viktor Korchnoi. As can be seen from the way I typed these names, I’m from the “simple is best” school. Not everyone agrees, however, which is why we see numerous variations of both names: Nimzovich, Nimzovitch, Nimzowitsch, and those three are just for starters. I’ve seen GM Korchnoi’s name spelled at least a dozen different ways. 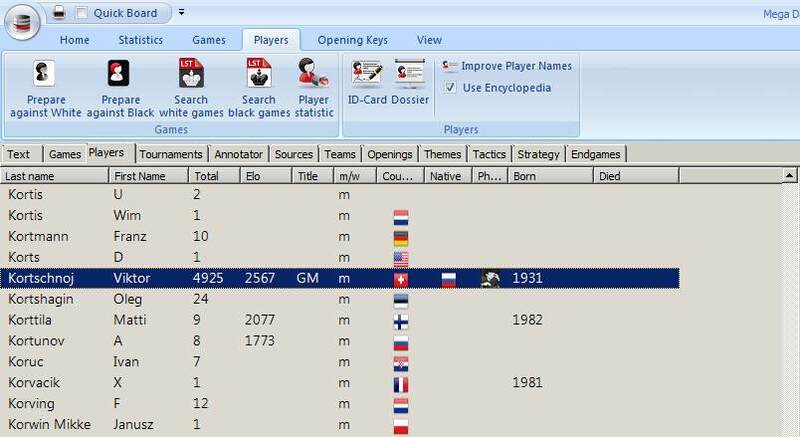 This can lead to problems in searching your chess databases, especially when you collect games from multiple sources; multiple spellings mean that you may miss games when you perform a search, or that duplicate games may appear in the database under different spellings of the player’s name. These multiple spellings usually result from acquiring databases from different sources: a database from ChessBase might spell a player’s name one way, while The Week in Chess might spell it another, and a database from a non-commercial chess website might give it a third spelling. Sometimes you might simply forget how a particular database lists a player’s name, with the result that you have to try three or four different spellings before you finally hit upon the right one. 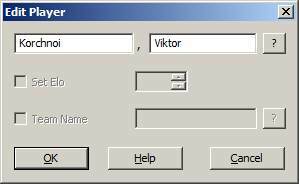 ChessBase 11 allows you to solve this problem by globally editing player names: you can change the spelling of a particular name in the headers of every game in a database, all at one shot. The first thing you’ll want to do is make a backup copy of your database in case you accidentally make a typing error or you just don’t like the result. This is important, because editing a player’s name is a global change (that is, one which affects the entire database) and there’s no “Undo” command. So please make a database backup first. I’m interested in editing GM Korchnoi’s name because I can never remember how ChessBase spells it in their commercial databases. So I’ve scrolled down to his name…what next? ChessBase 11 makes it that simple to standardize player names in a database, whether we have multiple spellings of a single name in the same database or we just want to change a name’s spelling to one with which we’re more familiar. Hiarcs13, the legendary chessplaying program which plays in a very human-like style, is available now from USCF Sales!